This is a great opportunity to do some easily accessible trail running right off Frank Sinatra Dr. in Rancho Mirage. 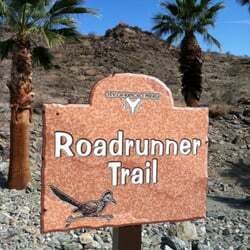 Near the Ritz Carlton hotel are two trail loops: the Jack Rabbit Trail and the Road Runner Trail. They are fairly narrow but the surface is good and this can be a run/hike sort of experience. Nice views. Best place to start is Rancho Mirage City Hall, right off Rt. 111/Frank Sinatra Drive. A 3.3 mile loop incorporates the Rd. Runner Trail, which is a steady 500 foot climb with grades up to 7%. It levels off after a mile and is more flat to downhill. On the way down, take the trail to Frank Sinatra Dr. or connect part way with the Jack Rabbit Trail. If you want to avoid the uphill, park at the Ritz Carlton and take the upper part of the Rd. Runner Trail. 3.3 mile loop. Other options too.